Bird Electron Japan has announced the EZ9B / W 45mm angular cube shape passive speaker with a stereo mini-input jack. 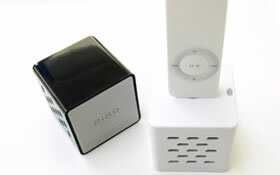 The plastic made cube has rubber base and can be connected directly to a portable player. . The cube speakers are available in two colors- EZ9B in black and EZ9W in white.As the speaker is without amplifier the volume is controlled via the portable player. The 2 channel passive speaker cube weighs 45gms. They are available in two colors EZ9B is Black and EZ9W is white. The base is made of rubber so it sticks on the surface. It measures 45 × 45 × 45mm and weighs 45 grams. The speakers will be available from January 24th for 3000 Yen ($ 25).